World View Successfully Executes NASA FOP Mission with an ARMAS FM. flightpath. The World View press release is available here, and the SPACEREF press release is available here. NASA SBIR Phase III Success. Automated Radiation Measurements for Aerospace Safety (ARMAS): Increased health and safety of commercial aircrew and passengers. The ARMAS flight module, now in its 6th generation, completed testing last year when the company monitored aircraft simultaneously over Hawaii, California, and Antarctica. SpaceWX Alert Monitor. As part of the NOAA Weather Ready Nation (WRN) initiative, Space Environment Technologies makes its SpaceWx Alert Monitor (SAM) site available for determining the effectiveness of forecast geomagnetic storms. FM2 have reported the aerospace radiation environment from over 100 flights. The FM5 business jet unit becomes available in 2016. JB2008 provides improved accuracy for LEO orbit determination precision, debris and collision avoidance maneuvers, and reentry planning during active solar conditions. Real-time and forecast data are avaiable, contact us at spacenvironment@spacenvironment.net for additional information. SIP v2.37 provides current epoch and forecast JB2008 solar and geomagnetic indices. 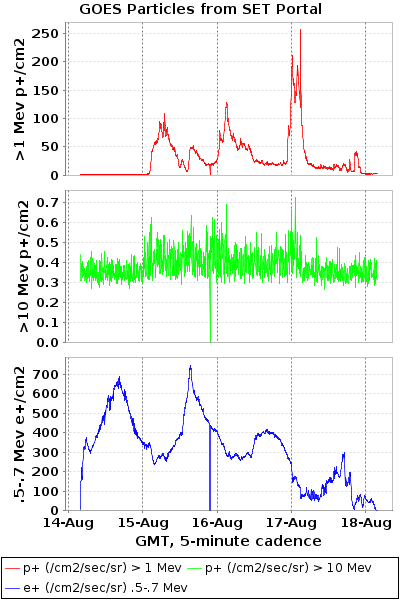 The new Geosynchronous Alert and Prediction System (GAPS) monitors space weather charging and deep dielectric discharge probability hazards at GEO orbit from the past 48-hours to future 72-hours. SET Funding: Space Environment Technologies has contractual relations with NASA through the Living With a Star (LWS), Planetary Atmospheres, and DECISION programs, with U.S. Air Force through the HASDM and SBIR programs, with National Science Foundation through the ATM and AST programs, and with NOAA through the CRADA program. readme.txt - README.txt file for the daily nowcast of solar irradiances and E10.7 from the Solar Irrandiance Platform.